4 Health Benefits of Papaya Seeds | Eat This! Not only are papaya seeds edible, but they are also good for you. Here are four health benefits of papaya seeds. Research has found that papaya seeds are effective against E. coli, Salmonella, and Staph infections. Research has found that papaya seed extract may protect the kidneys from toxin-induced kidney failure. 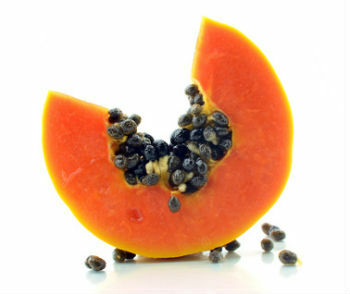 There is evidence that papaya seeds eradicate intestinal parasites. In a study done on Nigerian children with intestinal parasites, 76.7% of the children were parasite-free after seven days of treatment with papaya seeds compared to only 16.7% of the children who received a placebo. In Chinese medicine, it is believed that a teaspoon of papaya seeds will help detoxify the liver. Papaya seeds are often recommended by natural doctors in the treatment of cirrhosis of the liver.